GVK Emergency Management and Research Institute, Guwahati - HR Generalist, Program Manager & Others. Here is another great opportunity for jobinassam readers. 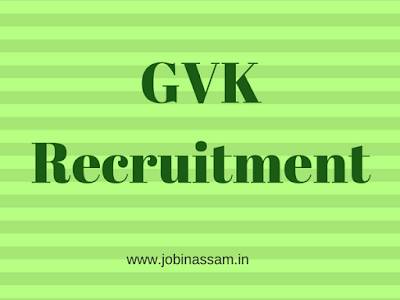 Jobinassam brings GVK news for you. 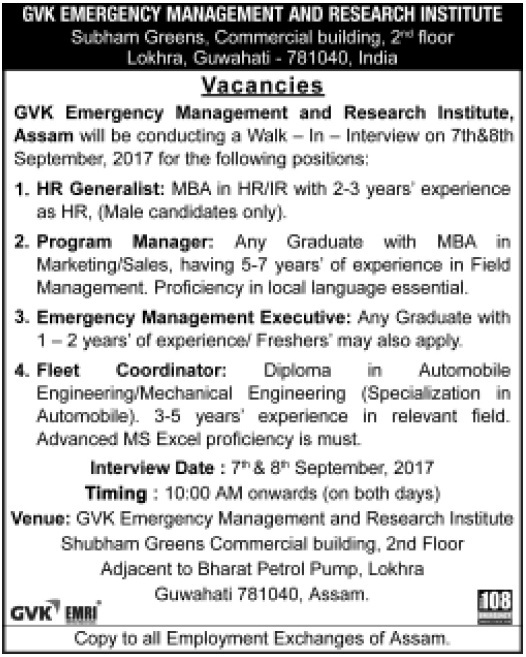 GVK Emergency Management and Research Institute, Guwahati has published a recruitment notice for the candidates of Assam. Eligibility- MBA in HF/IR with 2-3 years' experience as HR, (Male candidates only). Eligibility- Any Graduate with MBA in Marketing/Sales, having 5-7 years' of experience in Field Management. Proficiency in local language essential. Eligibility- Any Graduate with 1 - 2 years' of experience/ Freshers' may also apply. Eligibility- Diploma in Automobile Engineering/Mechanical Engineering (Specialization in Automobile). 3-5 years' experience in relevant field.